Coat the bottom of a glass or ceramic baking dish with coconut oil. Cut them into 8th. That means cut them in half. Then cut those halves in half and then cut those halves in half. 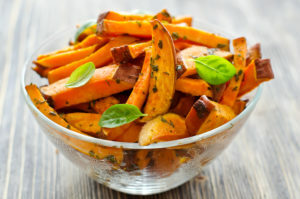 You will get 8, french fry, looking sweet potato wedges. Note: sweet potatoes cut unevenly as they are oddly shaped. Coat the sweet potatoes with some of the coconut oil. I like to rub the oil all over the sweet potato with my hands to ensure it is fully covered. Place the cut sweet potatoes in the baking dish. Sprinkle with cinnamon and Himalayan salt. Bake in a preheated 375 degrees F oven for 45 to 60 minutes or until soft.